With excellent measurement repeatability, exceptional vertical resolution and fast display update rate, the UDS-2020 is a powerful measurement tools for semiconductor testing, TDR characterization of circuit boards, IC packages and cables, and high-speed digital data communications. It is a key tool for R&D and production testing. The UDS-2020 is a PC-Sampling Oscilloscope, that is an oscilloscope for a Personal Computer. It requires just USB 2.0 (FS) or IEEE1284 (ECP mode) connector in your PC to give you the computing power of a standalone instrument within your PC. Test engineers, production engineers, and systems integrators find that this type of oscilloscope enables them to quickly create high-throughput test systems (for example, ATE systems) that are capable of measuring a wide variety of waveforms. The UDS-2020 uses sequential equivalent-time sampling technology to achieve a bandwidth DC to 20 GHz. Data acquisition and measurement analysis are performed in parallel, enabling the instrument to achieve outstanding measurement throughput. The instruments provide fast acquisition, repeatable waveform performance analysis with automated direct or statistical measurements, Markers and Histograms, Math or FFT analysis, high-resolution TDR/TDT, Color-Graded Display, Parametric Limit Testing, and Mask Template Testing. These measurements can be used independently or in concert. The multi-GHz bandwidth and the low-noise specifications allow very accurate measurements on low-level, high-speed signals. Time base stability, accuracy, and resolution allow characterization of jitter in the most demanding applications. 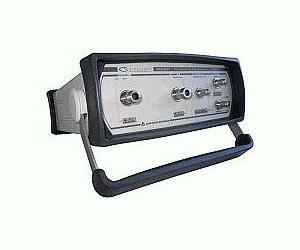 The instrument provides you with necessary capabilities to test and measure analog and digital circuits.